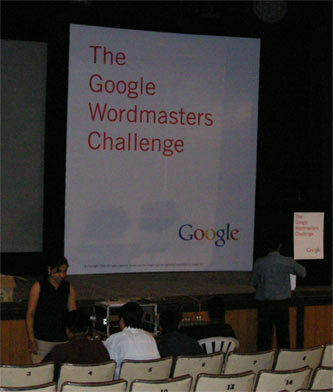 The Google Wordmasters Challenge 2006 was conducted simultaneously in 10 cities across India, these cities were Mumbai, Delhi, Chennai, Kolkata, Bangalore, Hyderabad, Pune, Ahmedabad, Kochi & Indore. According to Google reps this competition is the first of it’s kind conducted by Google globally. Per city there were 300 selected participants, so 3,000 participants in all !! Participants were given 20 keywords, from which they had to write an essay [minimum 150 & maximum 200 words]. 45 minutes was the time limit to complete this. Goodies by Google given to participants were a Google Bag containing a Pen, Keychain & a Writing pad, obviously all with the Google Logo. 3 winners out of 3000 participants of the Google Wordmasters Challenge 2006 will be announced on 30th October 2006. Here are a couple of pics from Pune. At the Nehru Memorial Hall, Pune. Google Organised the wordmasters & it was really fantastic to see people gathered from all fields for participating in wordmasters challenge. All were trying to gather their wits we could see some studying on Acronymns, synonyms & some of them referring dictonary in wordmasters pune challenge. 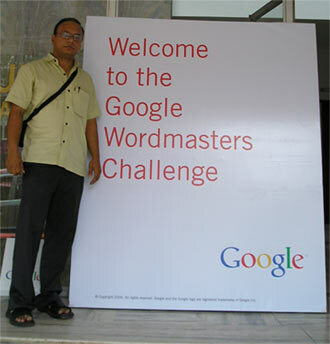 It was anice experience as I had travelled 120 kms from Ahmednagar to Pune to participate in the Google Wordmasters Challenge 2006. Really a nice experiment by Google through out the country. It was a fscinating experience. The choice of words left ample space for imagination and expression. I wrote to my heart’s content, while keeping an eye on the watch and word counts as well. literally i was ‘watching’ my words. Looking forward to more of such contests. That was really a stress experience. Earlier it was of 2hrs,at venue it was reduced to 1 hr. and then finally settled to 45 mins. The challenge was to gather 20 bizarre words in this 45 mins. miniature time period. And as expected, that was really a hard nut to crack.